At the School for Good and Evil, failing your fairy tale is not an option. Welcome to the School for Good and Evil, where best friends Sophie and Agatha are about to embark on the adventure of a lifetime. But what if the mistake is actually the first clue to discovering who Sophie and Agatha really are . . . ? The School for Good and Evil is an epic journey into a dazzling new world, where the only way out of a fairy tale is to live through one. 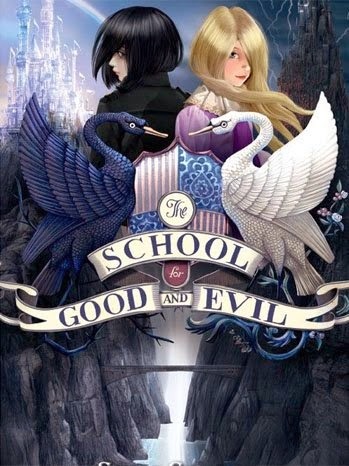 The School for Good and Evil looked to be a very promising read, and turned out to, just not in the way I had expected it to. I wasn't quite sure what I was expecting when I began reading the book, maybe a short term at the school then the two girls being sent off into their own fairy tales or something but whatever it was the book threw me for a loop within the first chapter. This story was far darker than I had imagined it being, told more in the style of a Grimm fairytale than most that we see today. By the time I had finished the book I had enjoyed it but I also had some issues with it. First of all while the story gets on to a very interesting start it is slow. Overall it's a pretty slow book. Yes there are times where things heat up and the action/story really get going but for the most part it moves along at a pace all it's own. While I liked the detail the author went into about the school the huge cast of characters began to confuse me and many of them blurred in my mind. I often found myself wondering 'Who was that again?' and 'When did they show up?' Another thing that really bothered me about the book was the way Sophie treated Agatha. They were suppose to be best friends but one minute she's all nice and the next she's mean and cruel. I can almost understand why it was done, but the story would have been better if their friendship had been done in a more natural way. Yes friends fight and they can be mean to one another but that is something that strengthens them. These fights were never really resolved, they just magically disappeared or in some cases got worse. It frustrated me. And the ending, what can I say about the ending? It didn't feel like one for starters. The whole ending scene felt very rushed and while it tied together plot threads it did it in a way that was both weird and almost uncharacteristic for the book. At the same time other plot threads were tied together neatly and very characteristic. And the books last chapter felt like the author just stopped writing and said 'See you next book!' giving us a conclusion without actually giving us a conclusion. It left me feeling very frustrated and eager for the next one to come out to find out what really happened. Now that I've gotten all the bad out of the way let me tell you what I did like about the book. The magic! The classes! The different schools! The fairytale history! I loved how it took the fairytale lore we know and love and put a different spin on it. I enjoyed both Agatha's and Sophie's character growth through the book, and while at times it seemed like one or the other was regressing in growth I appreciated the fact that the girls changed. Too often do I read a book where the main character grows a little but is stale for most of the book, this book did not do that. Even the more prominent minor characters began to grip me with their growth and personality. These are the one's that the author seemed to put a lot of time and effort into and stood out to me more than some of the others that tended to get jumbled in my head. By the end of the book I had really grown to care for each of the main characters and their closer friends. The story itself was great, as slow as it seemed in many parts it did keep moving. The story was very original, I loved seeing the way the two schools interacted with one another and how each class progressed. The different tests and games were amusing and I found myself very interested in the school's history. Just enough clues about whats really going on are provided for both the characters and the reader to begin to unravel what may have actually happened hundreds of years before, though you are still left going 'Say what?' when everything is finally reveled.